Job polarization is the academic term for when high-wage and low-wage jobs grow quickly while good-paying, family-wage jobs bear the brunt of recessions and don’t tend to come all the way back in expansions. Now, some of these changes in the labor market are good news, like the growth in high-wage jobs which has lead statewide gains this expansion. Other changes are relatively benign, like the growth in low-wage jobs which largely serve a growing population that likes to travel and go out to eat more. However the real crux of the issue is when someone loses a middle-wage job and is unable to find another one. This is what makes job polarization so problematic for the economy in recent decades. As our previous research showed, many of the former middle-wage workers dropped out of the labor force entirely and stopped looking for work. This is a terrible outcome for individuals, for their households, and for the economy. Today I’m not here to rehash all of the job polarization research (see HERE, HERE, HERE, and HERE for starters) but to provide an update based on the recently released 2018 occupational data. As a reminder, these big changes in the economy are best viewed through the occupational lens and not industries — which is how we typically talk about jobs — as these changes cut across all firms and are not confined to a specific industry. 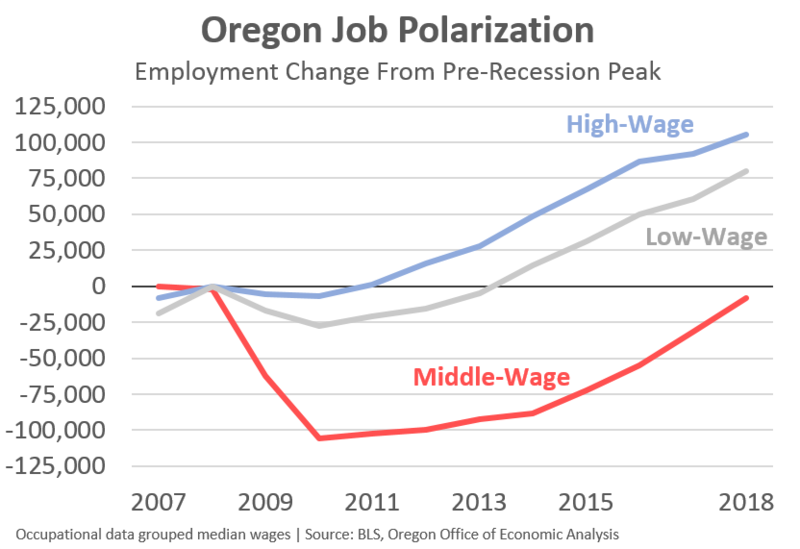 From a big picture perspective, last year’s job growth in Oregon was broad-based across the different groups and similar to what we have seen in recent years. However the good news is that the total number of middle-wage jobs in the state is nearly back to pre-recession levels, although we remain a few thousand short. The population-driven middle-wage jobs, like community service workers, educators, construction workers, repair(wo)men and the like are all back to peak, or nearly so. However, the more business support type middle-wage jobs like production, transportation, and office and administrative support ones are growing again but remain fewer in number than a decade or two ago. Digging into the data shows that some regions of the state have actually fully regained all of their middle-wage jobs, which was not true a year ago. Specifically, the Bend, Portland and Salem metro areas are now at historic highs for the number of middle-wage jobs. The gains in recent years, like the state as a whole, have been broad-based. All major occupational groups are seeing gains. However production, transportation, and office support jobs are lagging overall. (Except office support is doing quite well in Bend.) The other areas of Oregon are seeing gains as well, but have yet to fully recover their Great Recession losses. The fact that we now have a few regions that have regained their lost middle-wage jobs, I was curious to see how widespread this was across the country. In updating the polarization data for the nation’s largest metros, I was surprised. From 2007 to 2018, 45 of the 97 metros I have data for have fully regained their middle-wage jobs. 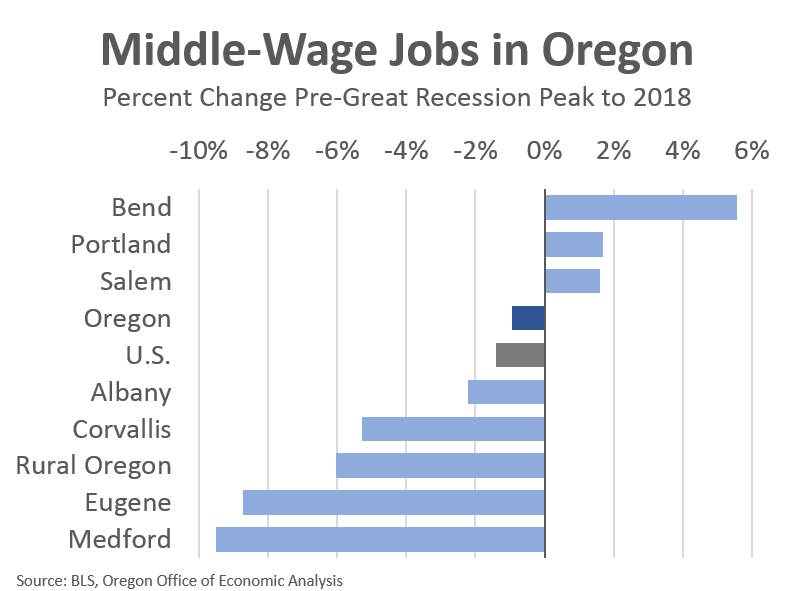 Portland’s middle-wage growth ranks 33rd best, but the gains across the nation are more widespread than I first imagined. 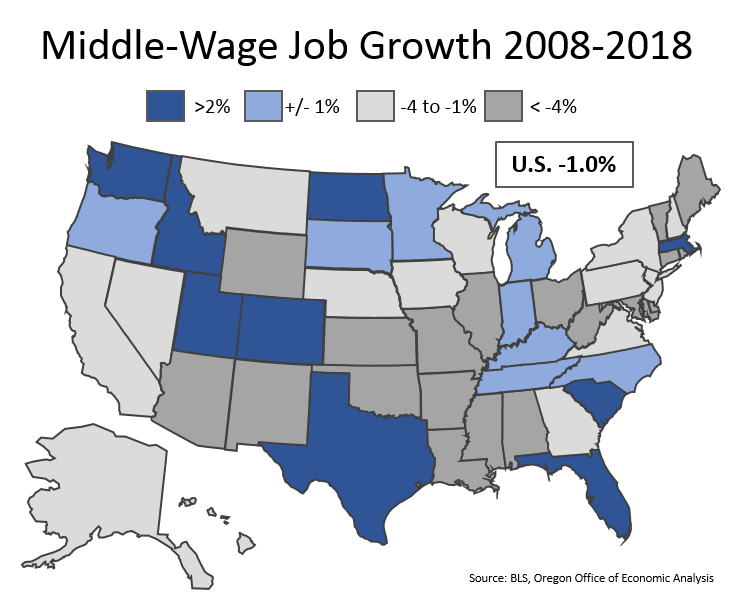 Now, when looking at state level data we see that very few states have regained their lost middle-wage jobs. In fact only 9 states today have more than prior to the Great Recession. Another 8 states, including Oregon, are essentially back with either a few more or a few less than a decade ago. That means 33 states are significantly lower today than before the Great Recession. In thinking this through, these findings do fit the overall pattern of growth this expansion. The nation’s largest metro areas turned around first after the recession and have seen the strongest gains overall. Given that many middle-wage jobs are in part driven by population growth, the fact that the big cities have seen the best employment and population gains means they are also more likely to recover their middle-wage jobs. Now, many of the nation’s secondary metros and rural areas are growing again — at least here in Oregon and across the West — but their overall gains are less pronounced than the big urban centers over the past decade. 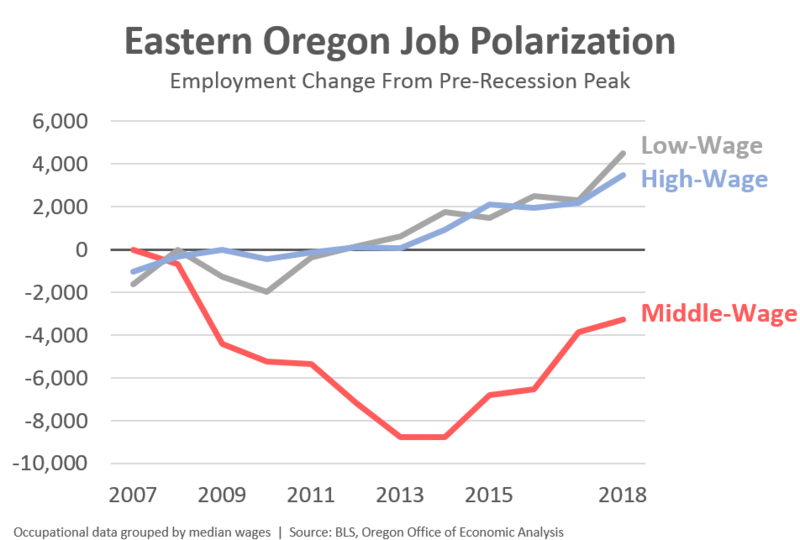 Finally, in thinking more about growth in rural areas and after giving a few presentations lately, I wanted to share an Eastern Oregon version of the job polarization chart. As I tell audiences, this pattern of job growth is seen in every single area or region that I have looked at. High-wage and low-wage job growth dominates, while middle-wage jobs lag. The main difference is urban areas see the strongest high-wage gains, even as the polarization pattern is evident everywhere. Note: Eastern Oregon here includes all counties east of the Cascades excluding Deschutes. Speaking of rural areas, I am currently in the process of updating our potential labor force figures by county based on new population data and forecasts. Stay tuned for more on that in the coming weeks.